Take the Bx26 bus east to the Garden's Mosholu Gate entrance. OR walk eight blocks down the hill on Bedford Park Blvd. (approximately 20 minutes). Turn left onto Southern Blvd. and walk one block to Mosholu Gate entrance. West Side Hwy North to Henry Hudson Pkwy North to Mosholu Pkwy (Exit 24). Continue to the end. Turn right onto Southern Blvd. At the third traffic light, turn left into the Garden. FDR Drive North to Robert F. Kennedy Bridge (formerly the Triboro Bridge) to Bruckner Expwy East (I-278) to Bronx River Pkwy North to Fordham Rd (Exit 7W). Merge onto Fordham Rd and stay in right lane. Turn right onto Southern Blvd, and continue to the Garden entrance on the right. Saw Mill River Pkwy South to Cross County Pkwy East (OR Hutchinson River Pkwy South to Cross County Pkwy West) to Bronx River Pkwy South to Fordham Rd (Exit 7W). Merge onto Fordham Rd and stay in right lane. Turn right onto Southern Blvd, and continue to the Garden entrance on the right. New England Thruway South (I-95) to Pelham Parkway West (Exit 8C). Pelham Pkwy turns into Fordham Rd after 2 miles. Turn right onto Southern Blvd, and continue to the Garden entrance on the right. Or Merritt Pkwy South to Hutchinson River Pkwy South to Cross County Pkwy West to Bronx River Pkwy South to Fordham Road (Exit 7W) Merge onto Fordham Rd and stay in right lane. Turn right onto Southern Blvd, and continue to the Garden entrance on the right. Throgs Neck Bridge to New England Thruway (I-95) North to Pelham Pkwy West (Exit 8C). Pelham Pkwy turns into Fordham Rd after 2 miles. Turn right onto Southern Blvd, and continue to the Garden entrance on the right. NYS Thruway South (I-87) to Saw Mill River Pkwy South (Exit 7A, just south of I-287) to Mosholu Pkwy (Exit 24). Continue to the end. Turn right onto Southern Blvd. At the third traffic light, turn left into the Garden. George Washington Bridge to Henry Hudson Pkwy North to Mosholu Pkwy (Exit 24). Continue to the end. Turn right onto Southern Blvd. At the third traffic light, turn left into the Garden. Bronx-Whitestone Bridge to Hutchinson River Pkwy North to Bruckner Expwy West (I-278) to Bronx River Pkwy North to Fordham Rd (Exit 7W). Merge onto Fordham Rd and stay in right lane. Turn right onto Southern Blvd, and continue to the Garden entrance on the right. Directions from Manhattan or Long Island may be preferable, depending on your starting point. 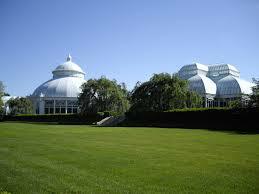 The New York Botanical Garden encourages bicycle riding as an environmentally friendly and healthy alternate means of transportation to and from the Garden. For bike routes to The New York Botanical Garden within city limits, please visit Ride the City.